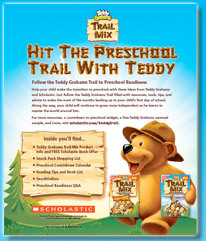 Click For Product Details Help your child make the transition to preschool with these online resources from Teddy Grahams and Scholastic. Just browse through the Preschool Prep Guide and click the links to the right for tools, tips, and advice to make the most of the months leading up to your child’s first day of school. Along the way, your child will continue to grow more independent as he learns to master the world around him.